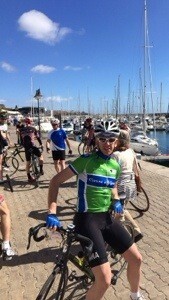 I can’t believe that it’s now four weeks since we were in Lanzarote at training camp! After a few days of rest & recovery, it was back onto the training plan and Gary was increasing the intensity. Before Lanza it had been a block of tempo work, and most of the sessions I did out there were at tempo too. This next block, however, we’d be moving onto threshold work. Threshold is essentially eyeballs-out, full-gas, race pace. This was going to hurt, as other than a couple of efforts up Fire Mountain in the sun & heat of Lanzarote, I hadn’t done anything like this since my last cross race in November. Over the next three weeks, we’d build up from 4 x 12 minute intervals, to the final week (ending this weekend) where I’ve got 1x13min, 1x15min, 1x17min & 1x20min to look forward to this afternoon! I’m doing these efforts twice a week – one on a Tuesday on the turbo & then on the road on a Saturday. The turbo sessions are amongst the hardest thing I’ve ever done on a bike, they are just horrible. There’s no change in elevation, no corners, no tailwind or headwind, none of the chances you get on the road for micro-recovery, a chance to re-group and get back on it. Nope, on the turbo it’s just one long intense effort. Absolutely brutal. It’s no surprise that the numbers I produce on the road are always better than on the turbo, it just feels more ‘real’. Like Mark Cavendish (the only thing I have in common with him! ), I find it hard to replicate the effort on a static bike that I can produce on the road. But one of my mantras is ‘what doesn’t kill you makes you stronger’, and that’s the mindset I’ve taken to these intervals. Coupled with the gym sessions that I’m doing this block, I can feel it all working, my strength growing and my form building. Tomorrow brings a 4.5 hour ride, with 90 mins of tempo and also the end of this block and a week of recovery. It’s also four weeks to my first race, the Ythan APR on Sunday 30th March. I can feel myself getting more and more excited about racing with every passing week, something I never expected to feel, or be doing, again. But having made a few major changes in my life for the positive over the past six months, I have a renewed energy and passion for racing my bike. Let’s see what this season brings. Next Post So the season has started…. To deal with the turbo I use: very loud dance/rap/pop music in headphones to drown out the sound of my screaming legs; break down long blocks into smaller chunks (2 or 3 mins at a time); counting to focus my mind and divert it from the negative chatter that tells me I can’t do it (1, 2, 3, 4, 1, 2, 3, 4). Sounds mental but is getting me through. Thanks Jay! Will try some of that in the next block, which I’m sure will be harder than this one. It’s interval 3 & 4 when I really start to struggle. Trying to hold 290w by then is almost impossible & I shout & swear a lot. Good job I’m in the garage, but I do wonder what the neighbours must think…..